Welcome to Holy Cross, a lively community of Christians who strive to follow the Lord Jesus in prayer, work and hospitality ‘by the power of the holy cross’ — the triumph of God’s love over everything that would divide, hurt and tear down human life and a good Creation. We are a diverse group of people, old and young, traditionalists and non-conformists, working and retired, gay and straight, leaders and followers, all committed to our church and each other, striving with all our resources to be the image of God’s love in our parish, our town and our world. 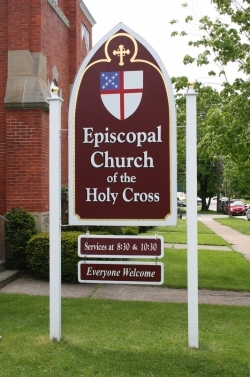 ...come to Holy Cross and experience the beauty and warmth of the great Anglican tradition of worship and prayer, and the joy of being part of a community committed to serving the world in Christ’s name. We are known as "the little congregation that could" for good reasons — the same reasons that virtually everyone who comes to us looking for a church home comes back again and again, and eventually stays. Do yourself a favor - give us a call or a visit. We'll be glad to see you, and you'll be glad you did.